Keep your make-up on you, Not on your clothes! NOTE: Please use first button if in Rep. of Ireland, the second button if in the UK or Europe and the third button for the Rest of the World. Please add contact phone number for delivery. This large box of Popon is for the fashion trade only and contains 60 pieces. They are for use in fitting rooms and are intended to be used as one per person. They are lightweight, breathable, see-through and completely disposable. Please note that the recent change in price is due to increased shipping costs from the Republic of Ireland. 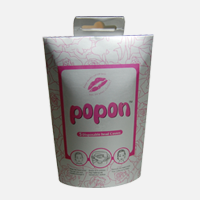 These small packs of Popon contain 5 pieces and are for sale to the general public. They can be kept in the bathroom or will fit easily into a handbag.